Breathable fabric mesh back with super cushioned mesh fabric seat. Integrated lumbar support encourages ideal back posture. 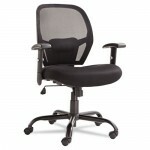 Removable padded armrests offer soft support. Durable, heavy-duty base with casters.